What is it about the aroma of slow-smoked brisket that quickens the salivary senses and sets the stomach grumbling, even if you’ve just come from lunch? Maybe it hearkens back to our cave-dwelling days, when clouds of fragrant mastodon smoke filled every cranny and brightened the gloom of a long winter night. Bobby-Q Great Steaks & Real BBQ has made a name for itself in the Valley, thanks in part to Chef Mark Hittle’s dedication to crafting succulent smoked meats, like the popular baby back ribs, here served with a side of broccolini and cornbread. But to appeal to the more health-conscious eaters, Hittle recently helped to introduce Q Bowls, featuring vegetarian and vegan options in hearty portions, like this Sonoran Q Bowl. Each meal is finished off with a complimentary bag of still-warm mini doughnuts (photo by Teri Carnicelli). Whatever the anthropological links, they kick in when you enter The Biltmore’s Bobby-Q, the newest of Bob Sikora’s barbecue spots in the Valley. Luscious aromas of smoke and succulent meat waft out the door, drawing you into a ranch house-chic interior with brick, barn wood and pressed tin ceiling. No hole in the wall BBQ shack this; think glamping, with food. Once there, you’ll have the happy task of choosing between brisket, pork, chicken, steaks, fish and burgers—a banquet of barbecue topped with a savory selection of sauces with just the right balance of tang and sweetness (my favorite is the Q-lina, a vinegary sauce with deep roots in Carolina barbecue traditions). And start with the cornbread. Try to stop with just one so you’ll have room for the main event, but don’t skip the cornbread, moist and buttery with a properly crisp exterior. Bobby is Bob Sikora, a longtime fixture in the Valley’s restaurant scene. From his first pancake stand, opened when he was 20, through Mr. Lucky’s, a nightspot with live music by such stars as Waylon Jennings and Willie Nelson, Sikora went on to open Bobby McGee’s first location in 1971 in Scottsdale’s Papago Plaza. Phoenix’s first location opened in 1974 at I-17 and Northern Avenue. Sikora found the sweet spot for pleasing diners, and Bobby McGee’s expanded to 24 locations in the United States and Australia. Eventually he sold the chain, all but the original location, and set his sights on barbecue. 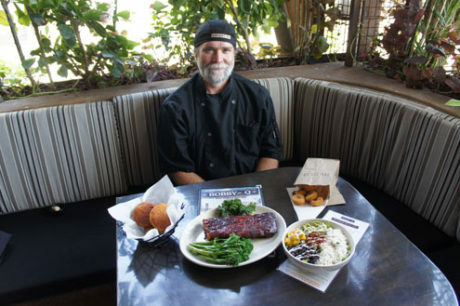 Mark Hittle is executive chef for the Bobby-Q trio of restaurants. He joined Bobby-Q 17 years ago, helping to open its first location in the remodeled I-17 site. He since has shepherded its kitchens through two additions, one in Mesa that opened two years ago, and the Biltmore location, which opened last October. “Bob got interested in barbecue and he went out on the road for a couple of years—Texas, North Carolina, everywhere—and learned everything he could and what he liked before opening the first Bobby-Q,” Hittle says. The brisket cooks for 18 to 24 hours at a low temperature, close to 200 degrees. Much the same for the pork. The ribs cook at 250 for about three hours. The main barbecue menu includes brisket, pulled pork, pork ribs, chicken, fish and beef ribs (Flintstone size). There also are burgers and sandwiches, salads and appetizers. And killer cornbread and bread pudding. Each table gets a complimentary bag of fresh-made mini doughnuts dipped in cinnamon sugar for the ride home (if they last that long). And there’s a twist at the Biltmore. “At this location we offer a lot of healthy options, including vegan and organic dishes,” Hittle says. “We get a lot of demand for it. We spent a lot of time and research doing them and came up with thee vegan organic bowls.” The combinations include a vegan’s delight of ingredients: coconut rice, guacamole, kale, spinach, peanut sauce, mango salsa, white beans, quinoa and cilantro pesto. With Bobby-Q, Sikora seems to have found another sweet spot. The company is considering another addition, perhaps in the West Valley, and it has a thriving take-out, delivery and catering business. Like Thanksgiving, when they’ll sell at least 500 smoked turkeys with all the trimmings. To hold you until then, there’s a special coming up for the Labor Day holiday: $40 for enough brisket, pulled pork, buns and sauce to feed six. Or truck on down to one of the Phoenix locations, including: 8501 N. 27th Ave., 602-995-5982; and 3154 E. Camelback Road, 602-626-8856. For hours and to view the full menu, visit www.Bobbyq.net.